From The Barefoot Contessa- How Easy is That? Saw Ina make this for a bake sale on Food network. 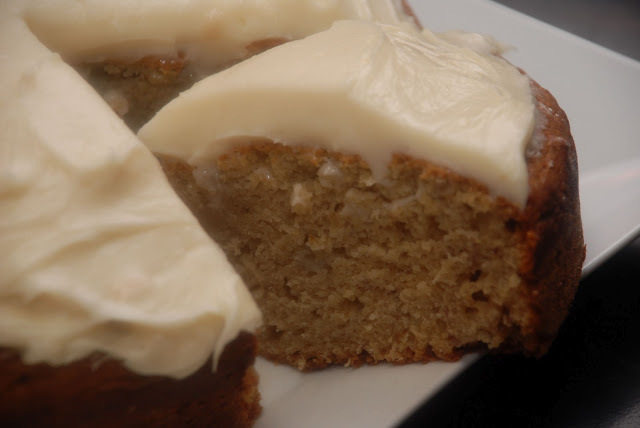 Basically, banana bread + cream cheese frosting. Upgrade! Preheat the oven to 350 degrees F. Grease and flour a 9 by 2-inch round cake pan. Mix the bananas, granulated sugar, and brown sugar on low speed until combined. With the mixer still on low, add the oil, eggs, sour cream, vanilla, and orange zest. Mix until smooth. In a separate bowl, sift together the flour, baking soda, and salt. With the mixer on low, add the dry ingredients and mix just until combined. Stir in the chopped walnuts. Pour the batter into the prepared pan and bake for 45 to 50 minutes, until a toothpick inserted in the center comes out clean. Cool in the pan for 15 minutes, turn out onto a cooling rack, and cool completely. Mix the cream cheese, butter, and vanilla in the bowl of an electric mixer fitted with the paddle attachment on low speed until just combined. Add the sugar and mix until smooth.